After breakfast, departure in the morning towards the High Atlas by the Tizi n'Tichka Pass (2260 m above sea level) .We pass through Telouet to visit the ancient Kasbah of Glaoui and the valley of Ounila. Kasbah of Ait ben Haddou, a UNESCO World Heritage Site. Lunch on site and then continue towards Ouarzazate. Visit of the movie theater optional (extra charge). Dinner and overnight at the Riad or similar. After breakfast, departure for Foum Zguid via Amazrou and Zagora, a desert road and a rocky landscape. Arrival at Foum Zguid, a small village well known for its huge oasis located at the gates of the Sahara desert. Dinner and overnight at Hotel Bab Rimal or similar. Breakfast, then small visit of the city of Agadir. You will visit the Medina, Souk el Had (the largest market in the region) and Kasbah Agadir Oufella, the oldest district of Agadir. After lunch, departure for Essaouira, drive through the beautiful coastal road, crossed by many fishing villages, arid scenery plunging in the Atlantic, beautiful countryside of argan trees, a road to discover. 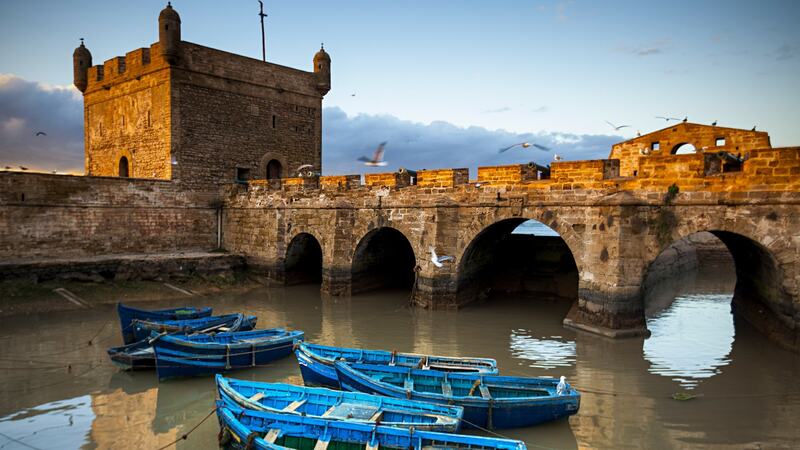 Arrival in Essaouira, its bastion and its cannons pointed towards the sea, a unique place in Morocco, visit of the Souk, art galleries, ramparts that served a long time of defense against the invaders, La Scala and the thuja market . Dinner and overnight at Riad Mimouna or similar. Breakfast at the hotel, departure for Marrakech, free lunch and day. Return to the hotel Tichka Salam or similar for dinner and accommodation.